Staying in town this holiday weekend? Looking for something new to do? Well then you may want to check out the newly opened Spokane Valley location of Altitude Trampoline Park. Altitude opened for the first time just this afternoon in the former Safeway at 1441 N. Argonne Rd. . The business spans about 32,000 square feet with trampolines throughout the building and 16 different attractions. Guests can check out a foam pit, rock wall, laser maze, basketball, dodgeball and much more. In all the new location employs more then 60 and is open 7 days a week. The park is also available for birthday parties and an a wide array of other events, just contact them directly for more information. The Spokane Valley location will be second location in Washington state for the Texas based chain. The company has experienced exponential growth recently with dozens of locations currently either under construction or coming soon, Altitude is even planning to have locations in Mexico and Tokyo, Japan very soon. Although it isn't publicly announced yet, it looks like we can now say that the Cracker Barrel chain of restaurants and country stores is coming to Spokane! Documents have been filed with the city, showing plans to build a new Cracker Barrel in North Spokane. The plans show the restaurant would build on the Northeast side of the N. Newport Hwy / E. Hoerner Ave. intersection, nearby The Y and the Northpointe Plaza shopping center. Those plans call for a new 9,170 square foot building to be constructed on the site. Along with a 1,316 square foot covered front porch, an addition that is a bit of an iconic feature for the chains restaurants. The restaurant would include a new surface parking area with almost 130 parking spaces. In all Cracker Barrel would occupy just shy of 2 acres with the site being devided, creating a new lot at the back along N. Colton St. . Inside the new Cracker Barrel will include seating for about 180 as well as a country store area. This space would sell small gifts, unique foods, country themed merchandise and more. All in all the new North Spokane Cracker Barrel will likely end up almost identical to the Coeur d' Alene location which just opened for business last year and has been packed most times since. Currently this new restaurant is in the planning / permitting phase so there will still be more details coming so keep an eye on this site for more as we will post more information as we get it. Cracker Barrel, for those who don't know is a chain of country / Southern themed resturants with breakfast, lunch and dinner. Their restaurants are family friendly and don't serve liquor. Very common along highways in other parts of the country, Cracker Barrel is a Tennessee based company that has been growing a lot lately. As of the latest information Cracker Barrel has 640+ locations and over 73,000 employees nationwide. 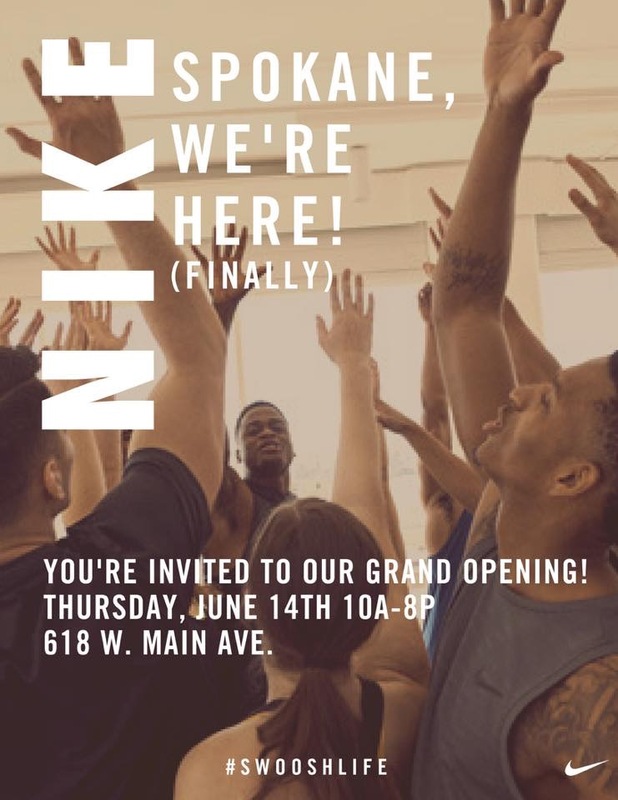 The opening date for Spokane’s new Nike store is here! We’ve watched construction crews build out Spokane’s first Nike Outlet store for the last few months. But, finally this afternoon we’ve been able to confirm that the store will open on June 14th at 10am! Spokane’s new Nike store is the first commercial tenant of the former Macy’s building, now called The M. Other stores and restaurants are still coming but not announced yet. The new store is a 12000 +/- square feet space carrying the full line of Nike products. Currently the next closest Nike store is in Auburn,WA. 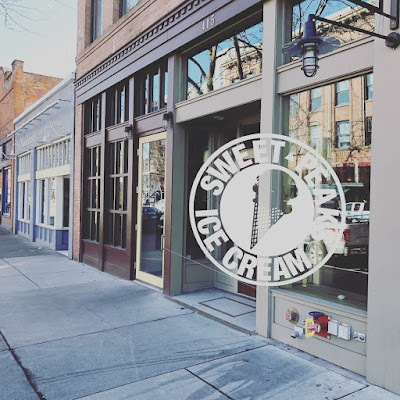 It's opening day for Sweet Peaks Ice Cream's new location in Downtown Spokane! 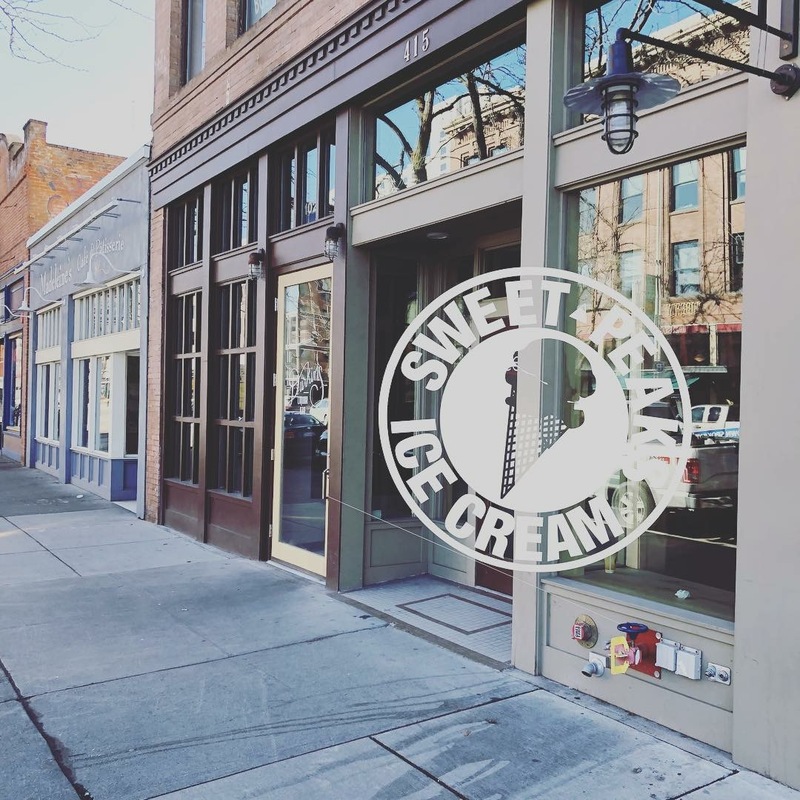 After a few months of remodeling the popular Sweet Peaks Ice Cream chain opens for business later this morning in Downtown Spokane. Their new location is next door to Durkin's Liquor Bar at 415 W. Main and is the seventh location overall for the Whitefish, MT based company. The Spokane store will officially open at 11:30am today ( May 11th ) . Customers will find nine signature ice cream flavors, joined by several more rotating seasonal flavors. The Spokane location will be similar to their other Inland Northwest location which open a couple of years ago in Downtown Coeur d' Alene. Beginning tomorrow Spokane now has a fast casual Poke' restaurant! It's been the talk of our Facebook page recently so I figured I'd take a moment on here to announce that Poke' Express is to open for business tomorrow ( May 11th ) at 10:30am . The new restaurant features freshly made poke' bowls and rolled ice cream from a storefront nearby Sacred Heart at 905 S. Grand. The restaurant is has similar concept to a Subway, which kind of make cense since it's location was last used by that chain. Which since Poke Express is a locally owned and operated business makes the news of the location all the more wonderful. Diners have the option to " build your own " bowl with a base, a protein , many side options, some sauce and toppings. Or, the menu will also have a few delicious sounding bowl options that have recommended combinations then built fresh for you. 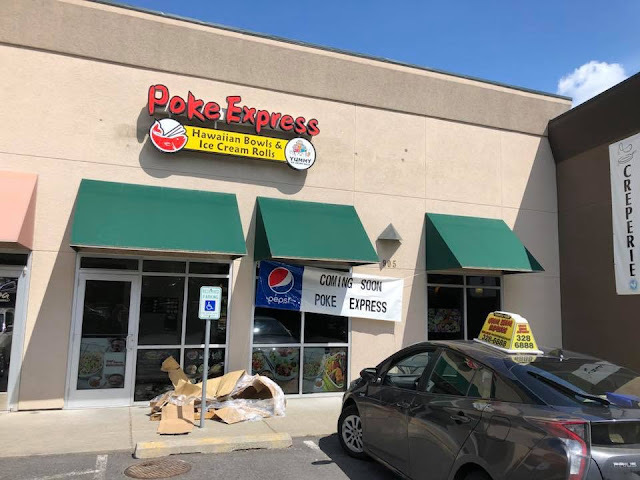 And, yes Poke Express will also serve the same rolled ice cream that they make at their sister restaurant, Yummy Ice Cream Rolls, which can be found on N. Division, by Gonzaga in the University District. A small new strip mall is in the works for the vacant lot at 11921 N. Division, just to the south of the Wandermere area. Planned is a 6900 square foot building with up to four storefronts, one being specifically geared towards a new restaurant as it would include a patio and drive through lane. Construction will likely begin sometime this year as the building is to be complete by March of 2019. Of the 4 storefronts one is leased, a space with a little more the 2100 square feet on the end but no news as of yet about what business will lease that space. The remaining spaces are up for lease and are being marketed by NAI Black. Currently space is leasing for $24 per square foot in line or $30 per square foot for the end cap restaurant space. 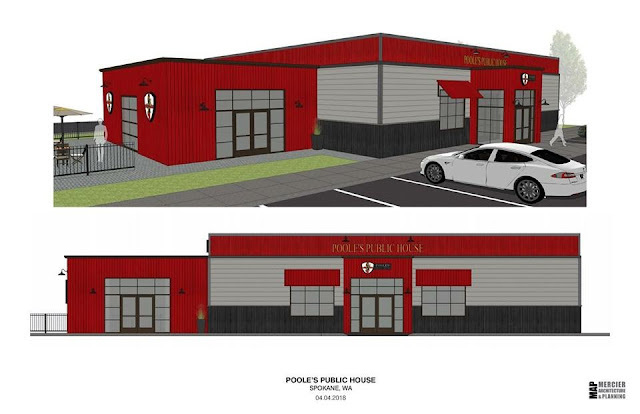 Poole’s Public House , a pub style bar and restaurant in North Spokane is making big plans. They are currently in a leased strip mall space at 101 E. Hastings Rd. but will soon replace that space with a new building all their own. They aren’t going far though as it will be just a bit to the west at 12310 N Ruby at Hastings and Ruby. The new restaurant will be a stand alone building with about 5000 square feet. It was designed by Mercier Architecture & Planning and Baker Construction will be the general contractor. 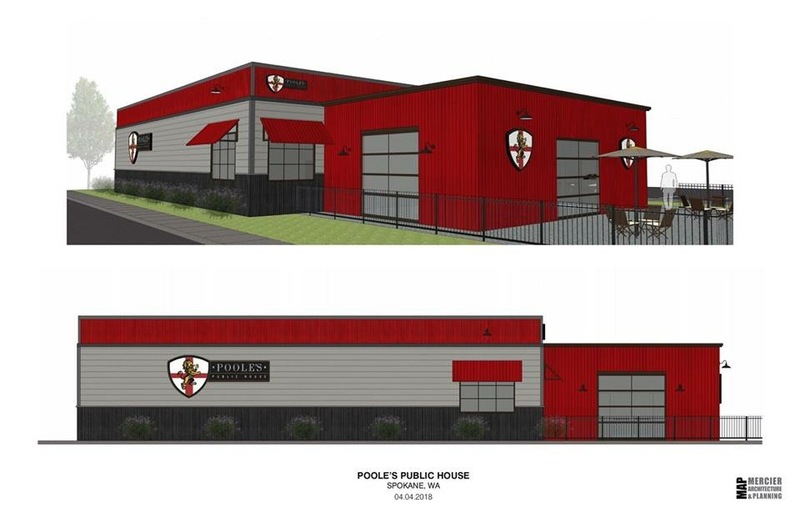 Below is a look at the purposed renderings for this new Poole’s Public House. The rumors are true, a fitness center is coming soon to the Fairways Plaza shopping center at 10511 W. Aero Drive. This is the shopping center that has been largely vacant since it's construction at the SR 902 exit off of I-90, except for a McDonald's & a physical therapy office. The fitness center will be a location of the huge Anytime Fitness chain and take up about 2 suites there or almost 6000 square feet. The goal is to have the new Anytime Fitness open sometime in the early summer. They plan to begin accepting members as soon as the end of this month. As is with all Anytime Fitness, members can work out at Anytime with 24 hour access via a key fob. Members will also get access to use Anytime Fitness' 4000+ other gym locations. This new location will also have a fitness studio with over 200 automated classes, a free weight area, many machines, men's & women's showers and occasional group events and outings. Personal training services will also be available. While this location will be a locally owned and operated franchise, Anytime Fitness actually a huge recognizable chain with locations throughout United States and several other countries around the world. The Minnesota based company has been in operation for about 16 years and can today boast more then 2 million clients. This will be the fourth Anytime Fitness location in the Spokane area with a couple more in the Kootenai County area.